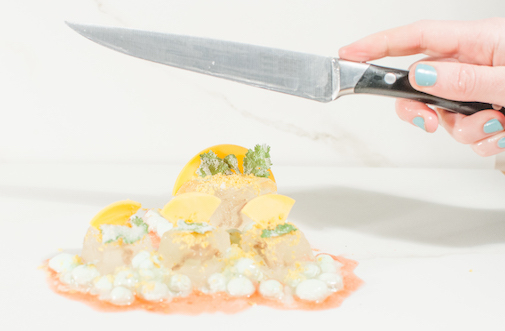 Down-home Molecular Gastronomy is a cooking and research project that uses American vernacular dishes produced with the techniques of haute cuisine to highlight the wealth, knowledge, and access disparity in our food system. Many of the regional “homestyle” dishes that seem the most comforting and familiar are also the most likely to contain endocrine disrupting compounds due to agricultural, industrial, or pharmaceutical processes. Often these foods contain cheap, popular, broadly distributed “commodity crops” such as seed oils, sugar, grains which have been grown with known endocrine disruptor pesticides and herbicides. Or they may contain factory farmed and processed meats and dairy products, from animals fed on industrially produced grains and treated with a variety of hormones. Plastic used in processing and packaging food products can also contribute testable levels of endocrine disruptors. 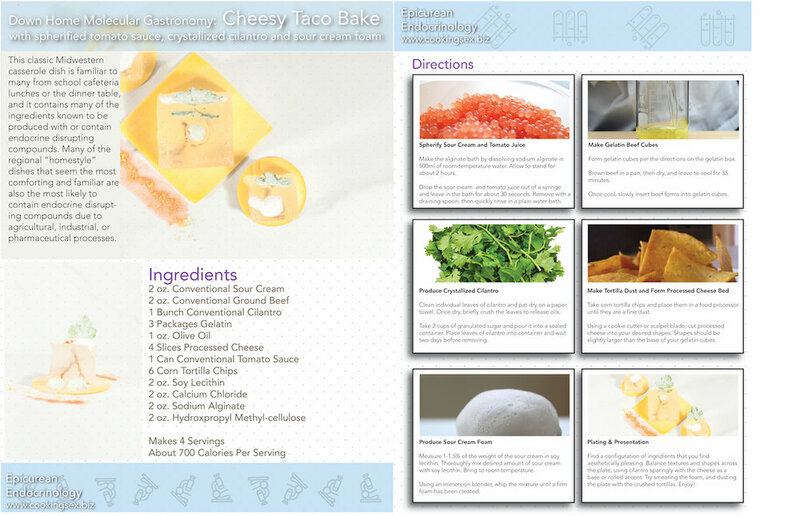 We selected “Cheesy Taco Bake” to recreate as Down-Home Molecular Gastronomy. This classic Midwestern casserole dish is familiar to many from school cafeteria lunches or the dinner table, and it contains many of the ingredients known to be produced with or contain endocrine disrupting compounds. “One of the most widely used and most troublesome endocrine-disrupting pesticides in the U.S. is atrazine. Manufactured by agro-chemical giant Syngenta, atrazine is sprayed mostly on Midwest corn fields and is consistently one of the most detected crop chemicals in drinking water." USGS map of locations of atrazine use in US. Via use of Atrazine in feed crops: Article from Global Meat News about livestock feed costs going up due to possible ban on atrazine. Via use of growth enhancing hormone implants - trenbolone acetate or TBA. Via Zeronol - a growth hormone given to cows in the US and Canada under the brand name Ralco. Sugarcane is the 3rd most common crop for use of atrazine.